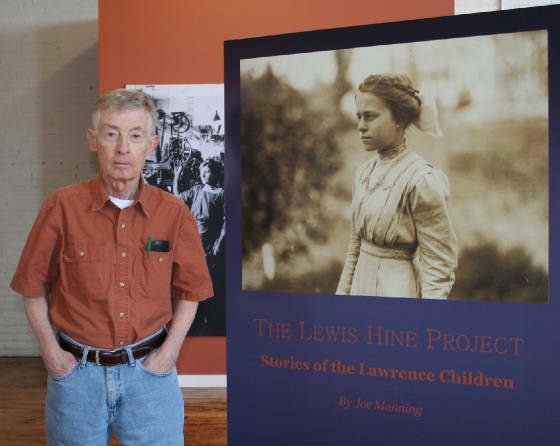 Joe Manning at opening of exhibit sponsored by Lawrence History Center, Lawrence, MA, April 14, 2011. The exhibit features my stories about the child laborers that Lewis Hine photographed in Winchendon in 1911. The museum is located at 151 Front Street, in Winchendon. For hours and other information, call 978-297-2421. This exhibit displays 10 of my stories about child laborers photographed in Lawrence by Lewis Hine in 1910 and 1911, and is installed at the Everett Mill in Lawrence for the foreseeable future. From time to time, it is temporarily moved to various venues, such as Lawrence-area schools and libraries. For locations and times, call the Lawrence History Center at 978-686-9230. For information about the grand opening in 2011, go to www.lawrencehistory.org/node/19749. Exhibit of my story about the Catherine Young family, photographed by Lewis Hine in Tifton in 1909. For details, call 229-391-5205, or go to: www.abac.edu/museum. The Mill Children traveling exhibit is based in North Adams, Massachusetts. It includes my stories of child laborers photographed by Lewis Hine in North Adams, in 1911; and also includes additional child labor stories depending on the location of the exhibit. Stay tuned for announcement of next location. Previous locations have been the Eclipse Mill in North Adams (2011); the Bennington Museum in Bennington, Vermont (2012); the Charles River Museum of Industry and Innovation in Waltham, Massachusetts (2012); the Cherry & Webb Gallery in Fall River, Massachusetts (2013); and the former Waverly Mill in Adams, Massachusetts (2014). From January to March 2014, the Lewis Hine Project was included in the Smithsonian traveling exhibit called “The Way We Worked.” It appeared at the Warner Theatre in Torrington, Connecticut.